On display for the first time in the Museum’s galleries is Portrait of Philip III by Velázquez, a work that has been donated by William B. Jordan to American Friends of the Prado Museum, which has ceded it to the Museum as a temporary deposit. Velázquez’s painting is displayed in the Prado’s principal gallery alongside Philip II offering the Infante don Fernando to Victory by Titian, which can now be seen following its recent restoration undertaken with the support of Fundación Iberdrola España, a Benefactor Member of the Museum’s Restoration Programme. Titian’s painting hung in the same room (the Salón Nuevo in the Alcázar in Madrid) as The Expulsion of the Moriscos by Velázquez, a painting directly connected with the new portrait of Philip III, which was executed as a study for it. 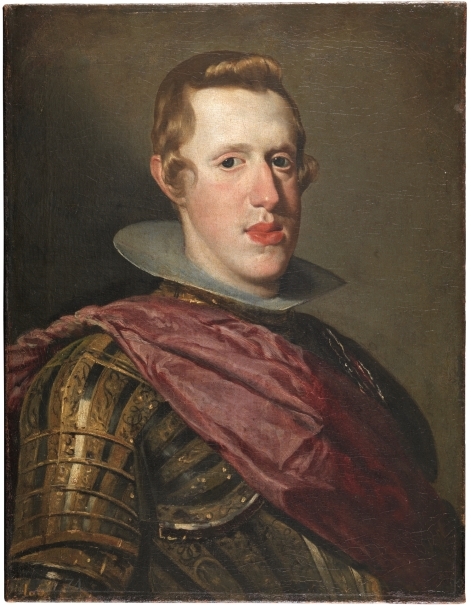 Portrait of Philip III by Velázquez was discovered and donated last year by William B. Jordan to American Friends of the Prado Museum, which has deposited it with the Museum. It is now on display in Room 24 of the Villanueva Building. This donation and long-term deposit at the Prado will assist in completing the Museum’s presentation of Velázquez as a court portraitist given that this is a painting previously unknown to scholars which casts new light on one of the key works painted by the artist during his early years at court: The Expulsion of the Moriscos. 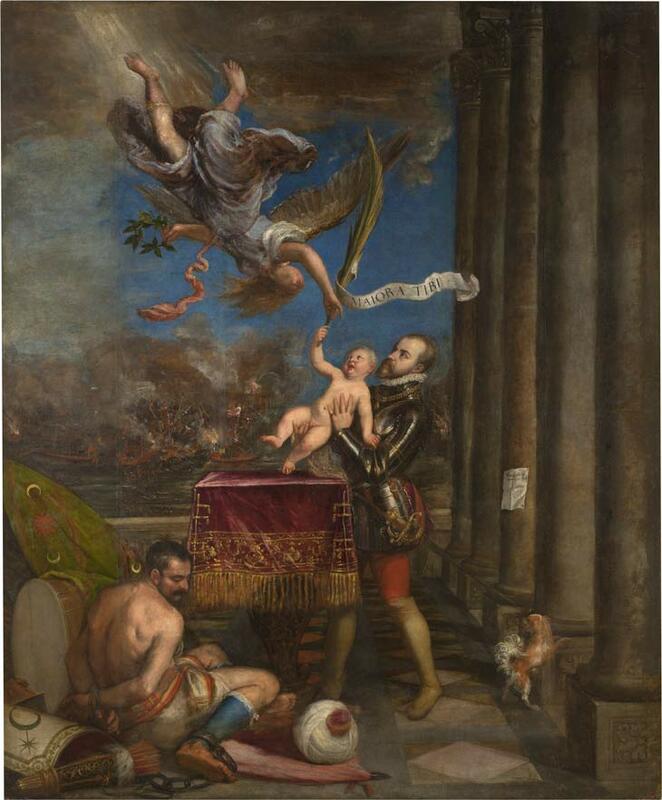 For this first public presentation of the new deposit, the Museum has decided to display it in one of its most emblematic spaces, at the heart of the permanent collection and next to Philip II offering the Infante don Fernando to Victory by Titian, which has very recently been restored. Also on temporary display here are Philip III by Pedro Vidal and Philip IV in Armour and The Infante don Carlos, both by Velazquez. Together they create a context for an understanding of the portrait of Philip III and for the reasons behind its attribution to Velázquez. The attribution of this work to Velázquez is based on three aspects: stylistic analysis, technical characteristics, and its relationship to The Expulsion of the Moriscos. 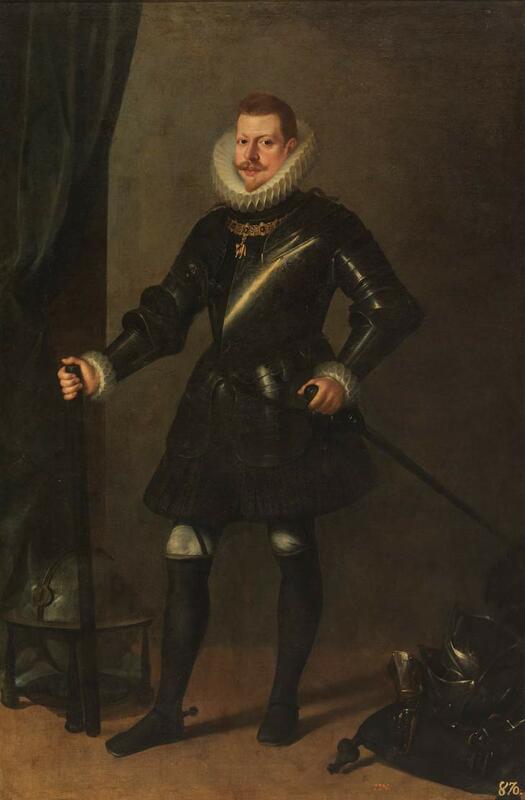 The painting reveals significant similarities with royal portraits painted by Velázquez between 1627 and 1629, such as Philip IV standing. Shared traits include the use of shadows to model the join between the hair and forehead; the expressive organisation of the face through a network of delicate points of light (on the eyes, nose, etc), and the modelling of the mouth and the surrounding area, the lips created from delicate variations in the intensity of the reds and the chin with a slight indentation. 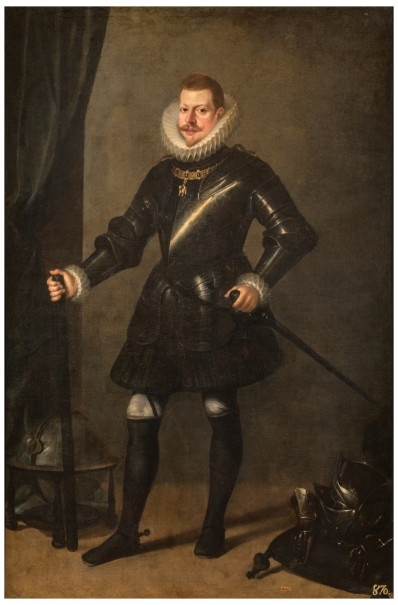 These characteristics are quite different to the style of Philip III’s portraitists, as becomes evident if this work is compared to Vidal’s Portrait of Philip III. 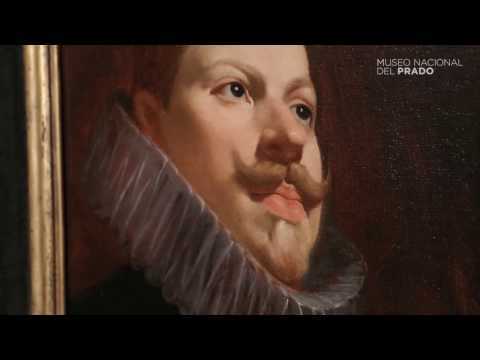 Technical analyses reveal practices employed by Velázquez between 1623 and 1629, such as the use of a dark priming; a comparable manner of connecting the forms of the figure; and a type of canvas similar to the type he used at this period. A comparison with The Infante don Carlos reveals the use of a similar type of background in which Velázquez made use of the reddish tones of the preparation, subtly modified with dark brushstrokes which together create a relatively dynamic surface. The present canvas of Philip III is a previously unpublished work with stylistic features and technical characteristics that allow it to be attributed to Velázquez and to be associated with The Expulsion of the Moriscos, a work painted in 1627 in competition with Vicente Carducho, Eugenio Cajés and Angelo Nardi. It was lost in the fire in the Alcázar in Madrid in 1734 but descriptions of it survive which confirm that the principal figure was Philip III, depicted standing next to an allegory of Spain and pointing towards the Moriscos as they were being expelled. 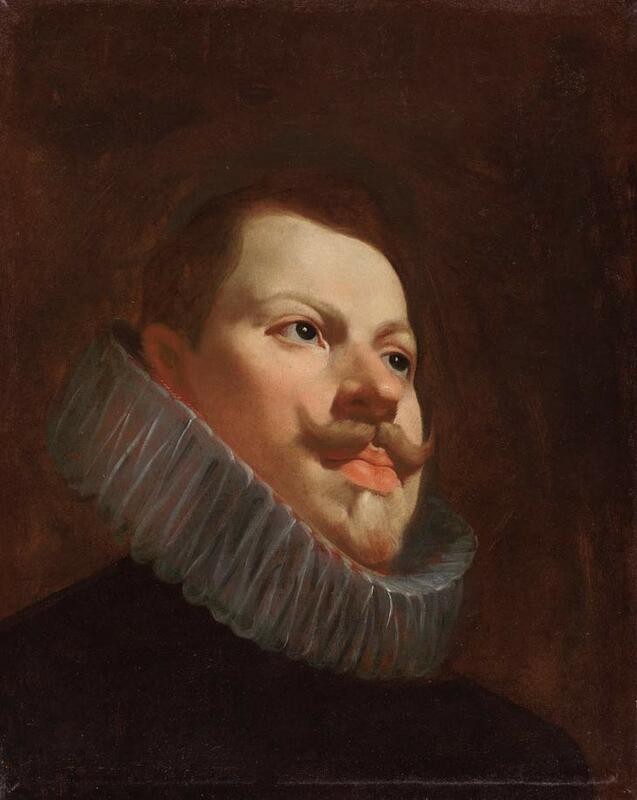 Velázquez never met Philip III, who died in 1621, and he based himself on portraits of the monarch by other artists. This canvas is a preliminary study that he used to establish an image of the King, explaining its sketchy nature as a working tool rather than an independent, finished work. The Expulsion of the Moriscos is the work through which Philip III would be present in one of the principal spaces in the Alcázar, the Salón Nuevo. That room also housed Titian’s painting of Philip II offering the Infante don Ferdinand to Victory, the dimensions and composition of which Velázquez bore in mind when devising his own work. This canvas commemorates two events of enormous importance for Philip II which took place in 1571: the victory at Lepanto on 7 October, and the birth of his heir on 4 December. The King chose Titian’s work to represent his reign and paired it with the portrait of his father, Charles V at the Battle of Mühlberg, also by Titian. From then on they were always hung together and in order to display the depiction of Philip in the Salón Nuevo it was enlarged in 1625 to make it the same size as the portrait of the Emperor. 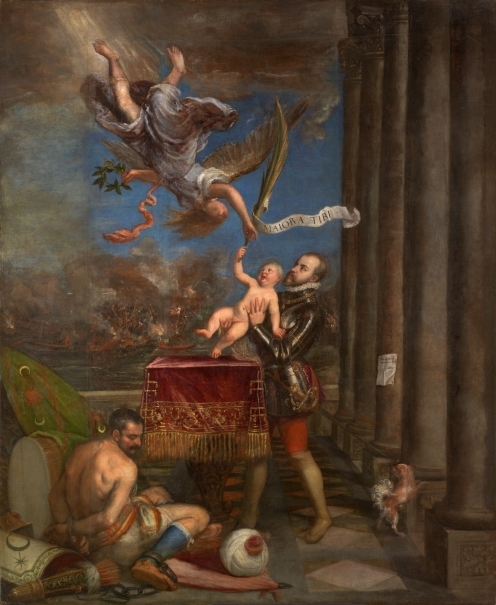 The recent restoration of Philip II offering the Infante don Ferdinand to Victory, undertaken by Elisa Mora and sponsored by Fundación Iberdrola España as a Benefactor Member of the Museum’s Restoration Programme, has recovered the qualities of Titian’s original but has also made Carducho’s enlargements more visible, particularly in the architectural elements. Following this presentation, the canvas will be shown with Carducho’s additions concealed. The most recent restoration was initiated in 2016 and finished in May of this year. Given the particular characteristics of Titian’s painting with regard to both its size and state of conservation, it has been particularly complex. Following analyses undertaken in the Museum’s technical documentation section and chemical laboratory, work began with the removal of surface dirt, oxidised varnishes and old areas of repainting from previous restorations. This cleaning, which uncovered some old losses, cracks and infilling with gesso, was undertaken in three successive stages until Titian’s original could be revealed with all its characteristic pictorial technique. After cleaning, two large losses that had been repaired with inserts in the past became visible between the table and the King’s left arm. The additions made by Carducho were found to be damaged and repainted, particularly in the left part of the sky. After eliminating these hard areas of repainting, significant losses and worn areas became visible. The blue pigments used by Carducho, which were different to those used by Titian and of inferior quality, had aged differently and altered, making his modifications visible, particularly in the Turk’s stockings. Once cleaning had been completed, the pigment was fixed in the areas found to be fragile and or with irregularities along the seams of the added areas. In order to restore the largest areas of paint loss, silicone moulds were made that reproduced the texture of the canvas and thus the characteristic vibration of Titian’s surfaces. Areas of paint loss and wear were first reintegrated with watercolour then, after the missing areas were filled in and the painting varnished with natural resin, a final adjustment was made to the colours. During the restoration of the painting it was decided to restore the gilded wooden frame that has always accompanied it.